Front Yard Bikes is a community bike shop that focuses on teaching participants of all ages how to fix and maintain bikes. We teach and develop skills in mathematics, physics and mechanics, while promoting inclusivity, mentorship, recreation and academic achievement. We offer youth in the community a safe, free after-school program. They are taught responsibility and become peer leaders as they are faced with ethical and moral questions in their day-to-day lives. The heart of our program is motivated by compassion for kids from low-income families that are willing to work for what they get. We hope to impact the youth of Baton Rouge, one bike at a time, one heart at a time, because the youth of today are the leaders of tomorrow. The Build a Bike program allows members of the community the opportunity to build their own custom bike for the fixed rate of $50. Customers can choose their own frame, tires, bars, cranks and accessories and build the bike of their choosing. Shop mechanics will be on hand to assist and offer advice. 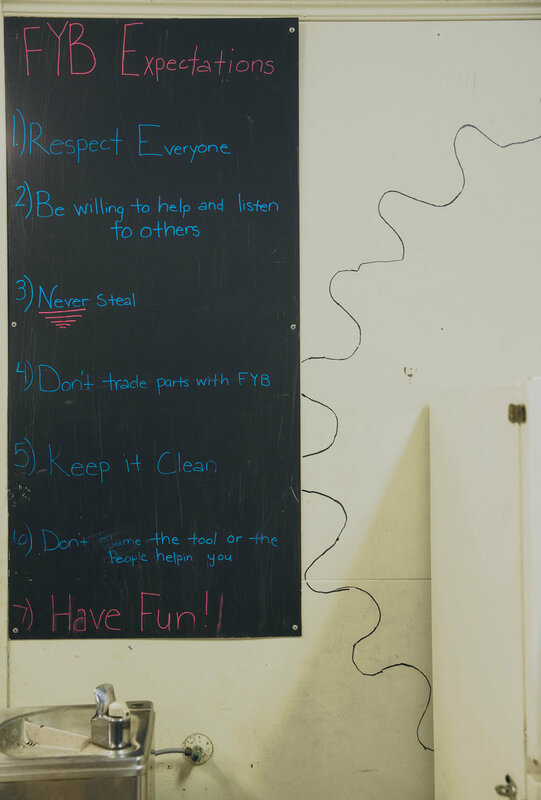 Our main program allows youth from the community to have the opportunity to work in our bike shop to earn their own bike. Youth work hand-in-hand with our shop mechanics to learn bicycle mechanics and bike maintenance as they move towards the goal of receiving their own bike. Every Friday from 4:15 to 6:00PM we embark on a bike field trip. These rides include trips to parks, libraries, museums, monuments and more as we embrace the fun aspects of riding bikes while exploring educational and recreational opportunities available within safe biking distance. All participants are required to wear helmets and know the rules of the road. One of the many tasks at Front Yard Bikes is to help with the garden. Youth participants can water, plant, weed, harvest, and weigh food. Anyone who helps with the garden is allowed to take produce home. From tomatoes and watermelon to mustard greens and sweet potatoes, we have a large variety of food for our kids and volunteers. To give our students more opportunities to learn valuable job skills, we now offer a welding program throughout the year. Students gain hands-on experience welding while having fun welding sculptures as well as functional metal works for bike shop. The class meets at our fabrication facility at the Youth and Family Services Center. Additional paperwork is required to take part in all welding related programs. Front Yard Bikes partners with VIPS (volunteers in public schools) to serve at Glasgow Middle, Westdale Middle, and University Terrace Elementary. We work diligently to keep our kids accountable in the classroom as they strive for their high-school diplomas. From recognizing positive behaviors to providing academic assistance during our Wednesday tutoring program, our kids understand the value of their education as they prepare for the job market. While he was a student at LSU, Dustin Lafont was constantly working on bicycles on the front lawn of his house in South Baton Rouge. One day, a young boy showed up and asked for help fixing his bike. Then he brought friend who also needed help, who also had a friend who needed help. Soon there were a dozen kids meeting in Dustin's front yard twice a week to learn how to fix and maintain their bikes. Since that first kid on the front lawn in 2010, Front Yard Bikes has grown to 2 locations and served over 400 youth in the South Baton Rouge. Dustin's belief that God will provide has been his primary motivation for meeting weekly with the kids of South Baton Rouge for the past 6 years. "These kids deserve the opportunity to learn, grow and ride in a safe place. God willing we can make that a reality." It's an honor to serve the best youth in Baton Rouge, and we wanted to find a way to honor them. Youth that display exemplary effort/knowledge in different areas earn badges to add to their aprons. Youth progress from red to yellow to green as they move throughout our program and become leaders in the shop. You're not a mechanic till you know how to use your tools. Anyone who shows a level of mechanical ability will earn this Badge of Honor. Academic achievement is vital to success. Anyone who earns good grades, or is recognized for their hard work by their teachers will earn this Badge of Honor. The shop doesn't accomplish anything if no one shows up to work in it. Anyone who spends 20 hours working in any area of the shop will earn this Badge of Honor. At Front Yard Bikes we like to keep it clean. Not only our bikes and work stations, but also our language. Anyone who shows dedication to keeping it clean will earn this Badge of Honor. Customers and donors drop by the shop all the time and we need to make sure they have a great experience. Anyone who shows exemplary customer service will earn this Badge of Honor. Youth are the heart of our organization, and they don't show up if they don't feel welcomed. Anyone who goes above and beyond to help other kids will earn this Badge of Honor. At Front Yard Bikes, we have a community garden. Youth are encouraged to get their hands dirty while planting and maintaining the garden. Anyone who puts 20 hours in working on the garden earns this Badge of Honor. BRONZE - you may be new but you're learning and growing, and we appreciate that. SILVER - you've been here a while now, and you've gotten the hang of things. GOLD - you're a leader here now, make sure you always act like one.